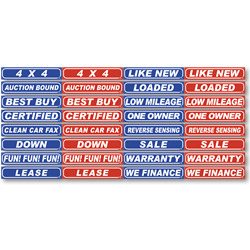 Grab your customer's attention with these vinyl windshield slogans! Low cost, high impact advertising. 14 in. x 2 3/4 in. Weight: 5 dozen - 1.05 lbs. Any orders placed prior to 3pm Central Standard Time will go out the same day. Any orders placed after cut off time will go out the following business day. Please allow 4-6 business days for product arrival.